The institute has a total of 100 seats in its MBBS course and out of these admission to 82 seats is through JIPMER entrance. Rest 18 seats are through nomination by Government of India and are are selected by the Ministry of Health & Family Welfare, New Delhi. 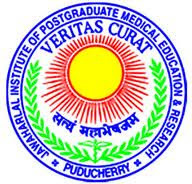 Candidates should have passed MBBS Degree recognized by the Medical Council of India.Must have either complete or due to complete 1 year of Compulsory Rotatary Internship by 31st March 2013.
conducted by JIPMER on 10th February 2013 (Sunday). For the MBBS course, the Entrance Examination is conducted at Bengaluru, Chennai, New Delhi, Calcutta and Puducherry. On-Line Application: JIPMER MD/MS 2013 Applications can be submitted by an ON-LINEprocess (Internet based) by accessing the website: www.jipmer.edu.in from on 10-01-2013. The Prospectus can be downloaded from the available link. Applicants may opt to remit the prescribed Application and Examination fee through one of the following methods. (a) Through the Payment gateway available On-line (Credit/Debit cards/ Net Banking). The Transaction fee has to be borne separately by the applicant only.